Election Aftermath Fiscal Data What Will Be the Bottom Line?Election Aftermath Fiscal Data What Will Be the Bottom Line? For the last few years, the Fed has been telegraphing that monetary policy cannot do all of the heavy lifting and that fiscal policy had to play a role as well. 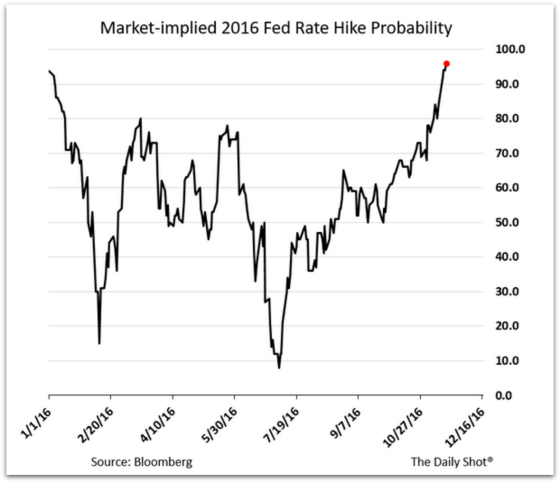 The market seemed to agree with the Fed and is also the reason that the market very rarely believed the Fed’s dot plot of the future path of interest rates. The plot was seemingly formulated in a vacuum as there was no sign that a stimulative fiscal policy would kick in and yet the dots somehow believed that something miraculous would materialize to make their plot path a reality. 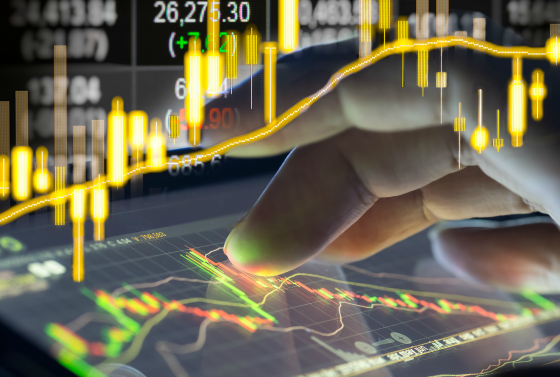 Absent a more stimulative fiscal policy and perhaps a less burdensome regulatory environment as well, the market did not believe growth would be significant enough to handle higher interest rates. Intellectually the Fed understood that fiscal constraint was a drag on growth and yet I just couldn’t tell the world that rates would stay so low for many more years. This would be an implicit indictment of its efficacy and yet it knew, quite correctly, that it needed a partner in Congress and the Executive branch. Hope is not a strategy. If there was any question about fiscal policy being the missing link it should be dispelled now by the dramatic increase in interest rates since the election victory of Donald Trump. This is what has happened to 30-year Treasury bond and 5-year Treasury note yields since the election. According to Bloomberg, this has been the worst two weeks for bonds in 26 years. 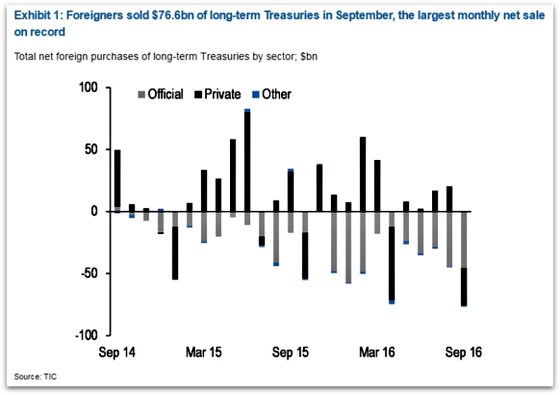 Maybe foreign investors knew something that domestic ones didn’t as they sold record amounts of Treasuries in September, more than a month prior to the election. They have actually been net sellers since March. I imagine the selling has escalated in the aftermath of the election but we won’t know until the data comes out. Global bond market losses have topped over $1 trillion since the election. Conversely, equity values have risen by more than $1 trillion with financials benefitting the most and interest rate sensitive companies like REITs, utilities and dividend paying stocks getting hurt. Banks are also being helped by the prospect of a less stringent regulatory environment which should lower the cost of doing business. Big tech names have fared poorly as well as there is a theory that since they were heavily against Trump that somehow they will face some retribution. In addition, they have some of the lowest tax rates so they may not benefit as much as other companies that pay higher taxes if corporate rates are reduced. On the other hand, these companies had performed quite well prior to the election so this can be more reflective of sector rotation and turn to companies that can benefit from higher interest rates. 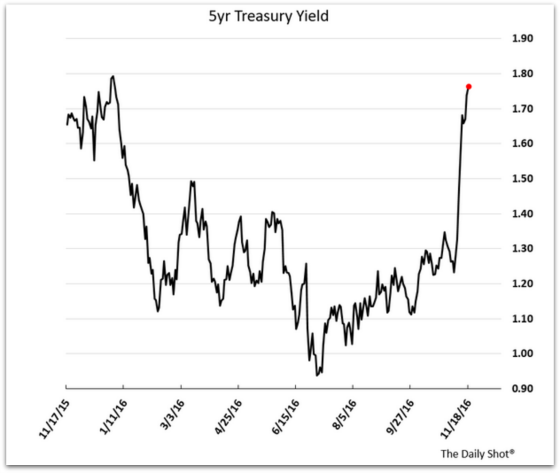 The following chart shows the real, inflation-adjusted yield for 5-year Treasury Inflation Protected Securities. 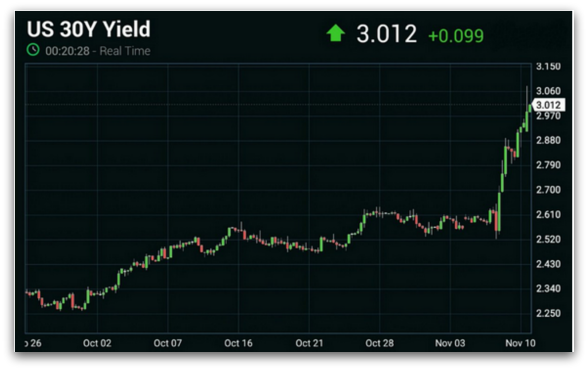 The real yield has increased by approximately 0.31% while the 5-year Treasury yield has gone up by approximately 0.47%. This indicates that investor inflation expectations have increased by 0.16% per year for the next five years and real returns have gone up by 0.31% per year. This implies that investors believe that Trump’s policies should improve growth prospects with mild inflationary implications. Thus, the movement in rates seems to be tied more to higher returns being available in the economy than inflationary fears. On the other hand, the second chart below shows that breakeven inflation rates have increased somewhat significantly since July (0.6% per year). Perhaps the market was pricing in a Trump victory far earlier than people realized? 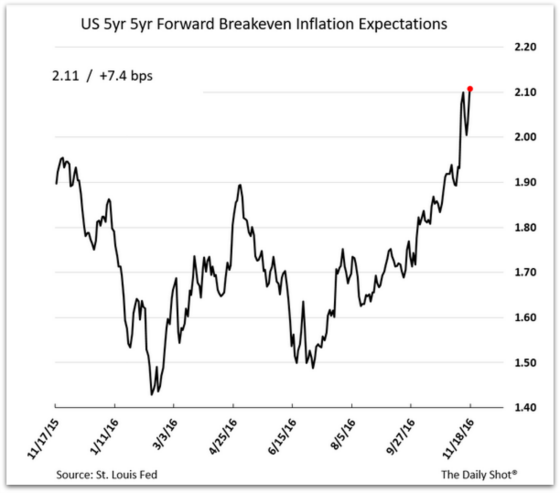 Inflation expectations are rising as measured by a Bank of America/Merrill Lynch investor survey. With the prospect of fiscal stimulus on the table via tax cuts and enhanced spending on defense and infrastructure, the Fed now has the last thing it needs to raise rates in December. The labor market has been improving, inflation is moving up, and the dollar had been behaving (that is now changing). The last thing it needed was the market’s confidence that the economy could handle rate hikes and it now has that as the following chart shows. 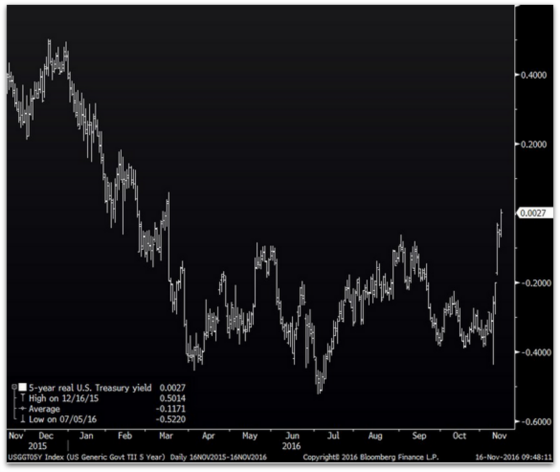 Has the bond market carnage been overdone and how will it ripple through the real economy? 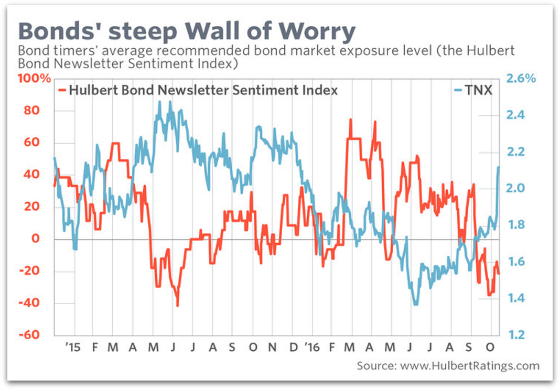 This first chart shows how negative sentiment has become among financial newsletter writers and how this can often be a sign that yields may be close to a peak. I listened to their conference call to discuss the election aftermath and their belief is that the Treasury sell-off is a true outlier if one looks at oil prices, gas prices, gold, silver, other inflation indicators, exchange rates, economic activity, copper, and demographics. 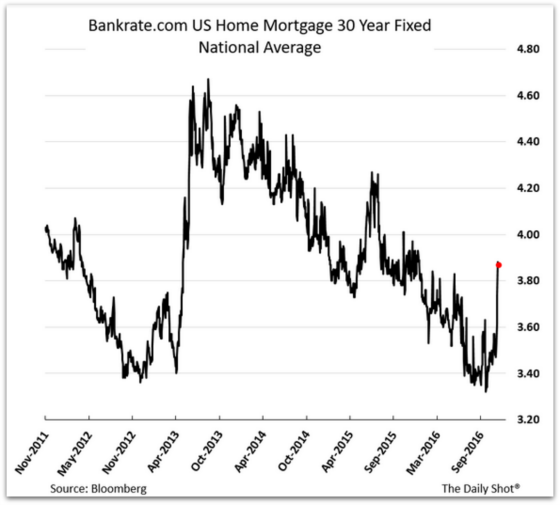 None of these other indicators have moved in ways to corroborate the rapid run-up in interest rates. 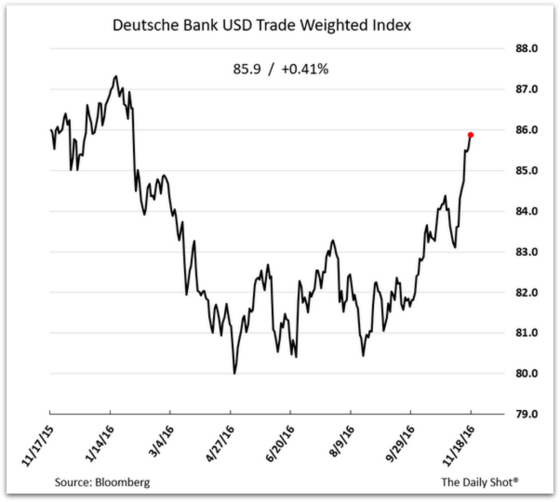 The dollar is starting to strengthen rapidly again which will create pressures for U.S. multinational firms and for those countries and foreign firms that have large dollar-denominated debt. When the dollar strengthens, this serves to tighten financial conditions and can negatively impact the real economy my making credit less accessible and more expensive and hurts U.S. exports. 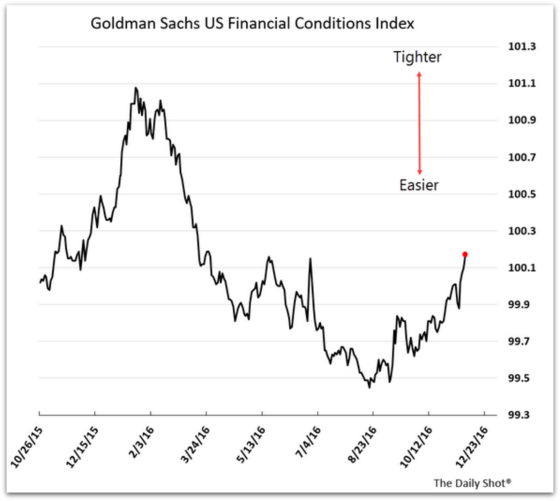 And with corporate leverage reaching cyclically high levels, companies with maturing debt will be more at risk of being able to refinance their debt as large quantities come due, interest rates are rising, and underwriting standards become more conservative, then this could cause issues for companies that may ripple through to the real economy. 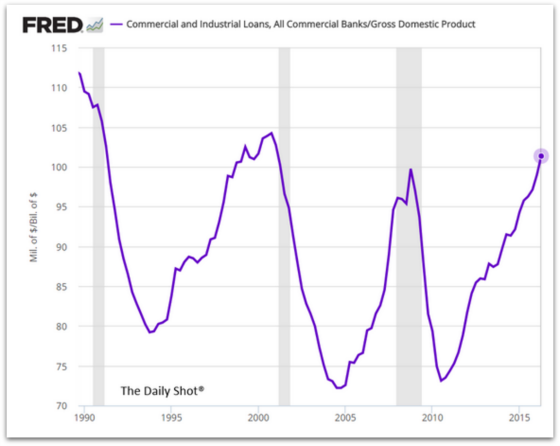 There is no evidence of this yet, but something we should pay attention to given the relatively high loan to GDP ratio. 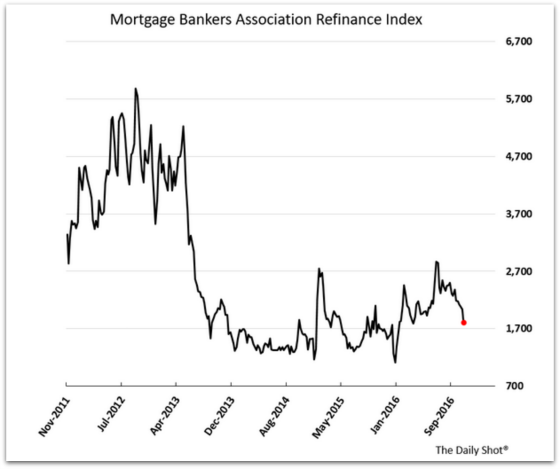 As rates have shot up, refinances are slowing down. 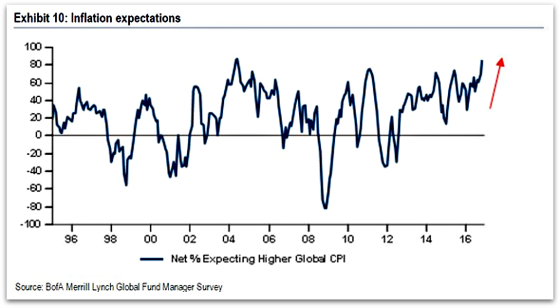 The charts show that the market is discounting higher growth, more inflation, and a less stringent regulatory burden. There are still a lot of unknowns at this point in terms of can the President get spending and tax cuts passed or will there have to be spending offsets so that the plan is deficit neutral? How much power do the Democrats in the Senate have since some legislation needs 60 votes to pass? Do the Republicans eat their ideals and go along with a large deficit increase because they now have a Republican in the White House? It will be interesting to see how Donald Trump is going to triangulate the various factions. He does have something for everyone to like as well as proposals that not everyone will be able to stomach easily. On the other this is the stuff compromises are made of as people can get some of what they want and have to accept some of what they don’t want.. Until I have more clarity regarding what will get passed by Congress and signed by the President I don’t see a reason to move away from our variable rate focus. This has been one of the great sell-offs in 25 years, we don’t know how the politics of this will truly work and what will get passed, and we still have the most powerful factor that will not change to contend with: the rapidly aging industrial world that will require more savings and dampen spending. For what it’s worth, 30-day Libor is about .56%. Two months ago the forward curve estimated that Libor today would be .62%. It has consistently overestimated what Libor would be in the future. Perhaps it is more accurate now with this sea change in sentiment. Its forecast for January 2018 is now approximately 0.60% higher than it is today. All in all, it looks like the market is pricing in rates being .25% higher than what was projected prior to the election. Is fiscal policy the missing link?